Apple at its special media event on Tuesday offered a sneak peek at AirPower, a branded wireless charging mat capable of charging up to three devices simultaneously. As rumored, Apple introduced a trio of new iPhone handsets, including an OLED iPhone X model, at its special event, each of which boast glass backs to facilitate wireless charging. The company failed to launch a branded wireless charger, instead relying on partnerships with Belkin, Mophie and other third parties. Apple SVP of Worldwide Marketing Phil Schiller, however, offered a sneak peek at a charging pad called AirPower. Designed by Apple, the all white, ovaloid mat can charge iPhone, Apple Watch and a new wireless-compatible AirPods case at the same time. Schiller claims the device has the potential to change the wireless charging paradigm, one set in large part by handsets running Google's Android operating system. Not much is known about AirPower aside from what little information can be gleaned from a few photos and a promotional iPhone X video. 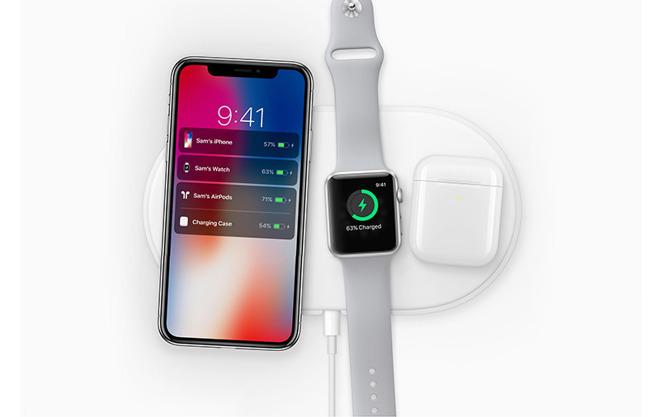 Aesthetically, AirPower takes after other Apple accessories like the Apple Watch Magnetic Charging Dock, with an all-white exterior and minimal design flourishes. AirPower appears to be connected to its charging puck — wattage unknown — via a single Lightning cable. The pad itself is large enough to comfortably fit an iPhone X, Apple Watch and an AirPods case, but there is little room left for much else. Seen in a short promotional video aired during today's keynote, iPhone 8, 8 Plus and X, as well as Apple Watch, play a special tone and onscreen animation when they connect to a wireless charging pad. Whether that alert will be customized for AirPower is unclear. Apple failed to mention pricing for AirPower, and Schiller did not offer an expected launch timeline. Apple later posted a dedicated webpage for the device, saying it will arrive in 2018.